The pig rearing business of free-range farmer Richard Scott has just come of age. Sue Scott finds out more. Do you have to be brave or foolish to enter the pig industry in 1998? Richard Scott proves it's pure bravery. Some might say Richard Scott was either brave or foolish entering the pig industry in 1998. At the time, a global slump in pork prices created a market where even the most efficient producers lost money. The following year, the unilateral ban on tethers and close confinement stalls for breeding sows is said to have to added 6.4p to every kg of already uncompetitive pigmeat produced in the UK. It was hardly an auspicious time for a pig farmer to sink everything he owned into a bare field with 200 ‘second-hand’ sows. But 18 years on, he is still going strong under his brand, Scott Free-Range, and despite the industry careering downhill from one of its low times and a mass exodus predicted, Richard remains focused. The most recent project is working on a redesigned watering system for his herd of Old Chichester Scott Spots, which are based in Cootham, West Sussex. "Turnover is vanity, profit is sanity and cashflow is reality"
Suffice to say the Old Chichester Scott Spots, of which there are 100 farrowing at Downsview Farm, started off as Large White cross Landrace, but breeding was tweaked over the years as Richard moved away from selling weaners to producing fully free-range finished pigs for local butchers. Keeping customers happy was and still is a priority, especially when there are too many pigs going to market across Europe, meaning there are more keenly priced alternatives to Scott Free-Range. But his goal from the outset was to devise a production model which could survive the fairground ride of pork price swings. And he has succeeded, largely by sacrificing what he calls professional vanity for economic sanity. “I have rarely lost customers on price. I would say to any farmer, think seriously about dropping prices to keep up volume, as you may be better losing a few customers and maintaining your price point. Keeping his nerve when foot-and-mouth hit in 2001, threatening to knock his fledgling weaner business on the head, is was what led Richard into supplying butchers. He says: “I was unable to buy replacement breeding stock for a while, so I reared my own. Two years later, he left his agricultural teaching job at Chichester College’s Brinsbury campus to go farming full-time. Looking back, the difficult time taught him an important lesson. He says: “I have found where there is a problem or something goes wrong, there is usually a positive to come out of the situation. With just one full-time staff member, plus crucial back-up from wife Aimee and their second eldest son Alex, Richard manages four delivery rounds to more than 30 butchers a week and gets 2,000 finished pigs off the farm every year. But, however punishing the schedule, he is reluctant to give up the face-to-face contact with customers. “I am fussy about giving butchers what they want. Mainly this is extra fat cover and we have changed the breed slightly to increase it. “But rearing pigs outside and trying to get them fat enough for butchers is tricky. The point of difference is important, although he is not convinced consumers fully appreciate it. "If something breaks and you think about it hard enough, you will come up with a faster, better, safer or more efficient way of doing it than you would if you never had to think about it"
He says: “I run a free-range operation, not outdoor reared – this would not be good enough for me. 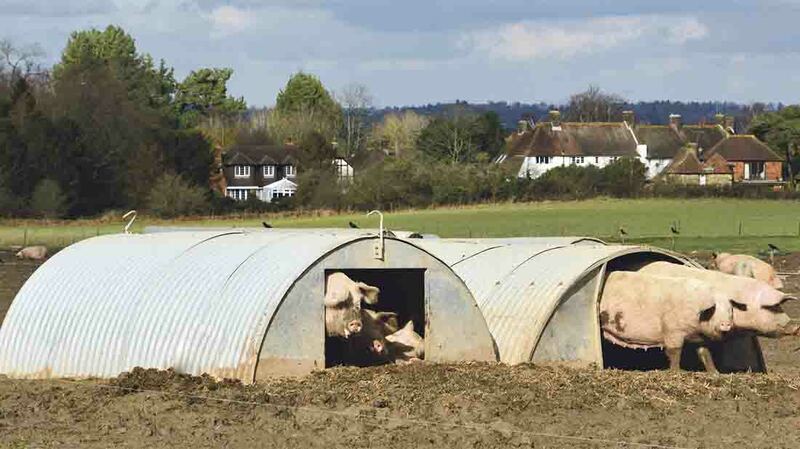 Focus is retained to other areas of the business when he decided to reduce the number of sows by half, when, after 10 years of commuting between rented sites across Sussex and Hampshire, Richard consolidated the business onto one piece of land in 2008 and added a cold store and cutting room. Three years later, he built a 20-metre by 6m (66ft by 20ft) steel-framed temporary dwelling on to the site – the first time he had been able to live on the same plot of land as his stock – and the family moved in. Last Christmas, they finished building a farmhouse. Owning his land has finally put him on the front foot, he says, even though the investment means he has put a self-imposed limit on expansion. Together with Aimee, also a former college lecturer, he met any objection to the farm from locals head-on, attending the village market to explain production methods and opening Downsview Farm to visitors. About 400 people turned up for the first hog roast and tours and 700 came to the second. After 18 years, Richard has finally achieved his ambition – to be in full control of his business and not beholden to banks, landlords or market forces. But this does not mean there are no positive plans for the future. “You have to be able to keep saying to yourself ‘This is good’, ‘Yes, that will work’ and thinking ‘Where will the business be in a year’s time?’, irrespective of where the money is going to come from. For now, Richard is looking forward to building his new deluxe pig arks, which he says are more like miniature barns and are a sizeable investment. He says: “Eventually, I would like to get to the position where I can just enjoy managing pigs without manning all other pumps at the same time. It doesn’t sound a lot, does it? Next: Brexit Briefing: What would replace the CAP if the UK voted to leave?